Congratulations, you’ve taken the first step on the road to transitioning out of your company and moving on to an incredibly rewarding and exciting time in your life. After you sell go play, do some business or both. Nobody ever said you had to stop having fun. 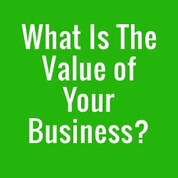 The Proxy Valuation Form contains seven steps to guide you through the process of determining the current proxy value of your business. These steps enable you to get a starting point for the value, it is not as accurate as a true business valuation but it is great for the purposes of determining whether you are anywhere close to where you need to be, or want to be, for sale purposes. ​If you have any questions please contact us, we can help you complete the form and work with you from 'I'd like to sell or transition through to I've sold.' This is not a do it yourself endeavor. It takes a team to transition a business successfully. Find out how a DIFY (do it for you) company can help. Start your confidential one on one conversation by contacting our CEO Eric Gilboord by email at eric@warrenbdc.com or call 416-270-2466.